After asking my Modern Asia seniors what they wanted to learn a few weeks back, we started moving through their choices. A few days on Khmer Rouge, Cambodia and post-Vietnam War Vietnam left me wondering where to go next. It helped that President Obama was in the region. Looking at the lists they made, Southeast Asia was the next logical choice – ASEAN in particular. The question was what to do. I began with my standard approach of looking for readings the students could do and video clips to watch. While scanning articles on ASEAN today, I noticed that the organization is working to improve its integration through a program, ASEAN Connectivity. One aspect of that is tourism. It was the most interesting for me to read about, drawing my attention away from economic integration, political concerns, etc. I think I was feeling in a bit of a rut – we were taking pretty much the same approach to each new place we considered. I had an idea – what if I had my students begin looking at the region through tourist eyes? They have had so little exposure to the area that even basic geography would be useful. Out of nowhere, but after wracking my brain for a few days about how to keep the students engaged in learning about this region, it hit me. There would be no common reading, no written assessment. They would create brochures, paper or electronic, that would market tours of the region that they would plan. I would gather a few willing colleagues to review the brochures and select a trip. What happened next exceeds even my highest expectations. Students cannot wait to get to class to work on their tours. They are taking into consideration the teachers who they will be marketing their trips to, and they have even taken to recruiting more on their own. There is now a list of 22 teachers who will review their work and choose which trip to take. The sheer number of things the students are considering in their planning is amazing – infrastructure, safety, distance, a range of activity to appeal to all types of people. They are learning what the local history is as well as information about the local population. Many are navigating between the type of trip they would like to take to something that would have broader appeal. In considering how they would design and share, they are using programs to create infographics, learning as they go. When I decided to run with this idea, I did not know how well it would work or how seriously the students would take it. Not only are they taking it seriously, they are owning it. I cannot wait to see the final products. They are going to be judged by how many teachers choose their trip. I will also look at each one individually to provide feedback on the different components. They asked me at the beginning how I would grade it. I told them I had not thought about that yet. They have actually not asked since. I admit that I am still not sure. As I look at our school’s teaching and learning paradigm, which highlights five habits of mind we want to teach students, this project fits better than I could have planned. Creativity – check – they are making their own tours. Curiosity – check – they are investigating things that intersest them as they go. Empathy – check – they need to think about what might appeal to others. Reflection – check – they have to think about the implications of their choices, in terms of their tours, their clients and the local populations where the trips go. Resilience – probably, although most likely to be seen in that latter stages of the project nearer to the due date, or in dealing with the disappointment when someone does not choose their tour. What amazes me is the simplicity of the original idea. What energizes me is the commitment of my students. What frustrates me is that this does not happen more often. I started the semester planning a research project for my Modern Asia class instead of a final exam. That felt progressive to me, and it still does. That was what I had my class do last year, and it went well. This year, I decided to ask my students what they wanted to learn. I blogged about that already. They gave me many good ideas, but what I realized is that there is enough common interest and desire to continue working together as a class, rather than dividing into projects. This class has a lot of questions and areas they want to learn about. We started down this path with the Khmer Rouge and Cambodia and now will look into post-Vietnam War Vietnam. This type of plan seemed to need a different type of summative assessment. My idea is the summative portfolio – four pieces with four due dates that can be done in any order. There is a mix of common tasks and individualized work. I am hoping this plan will allow my seniors to keep learning what they want while they reflect on all that we have done. They will be able to synthesize and analyze content while they demonstrate the skills I hope they have acquired. Here is my draft version of the requirements – comments and suggestions welcome. I am already getting some helpful feedback from my librarian. What is it I want students to know/demonstrate? 2. Evaluation of book sources – Comparative Book Review (of two books read in course) – What each book contributed to understanding of China and India; strengths and weaknesses of each – show NYRB as example. I hope that this allows students to demonstrate their learning in a way that is useful for them. What my students want to learn. 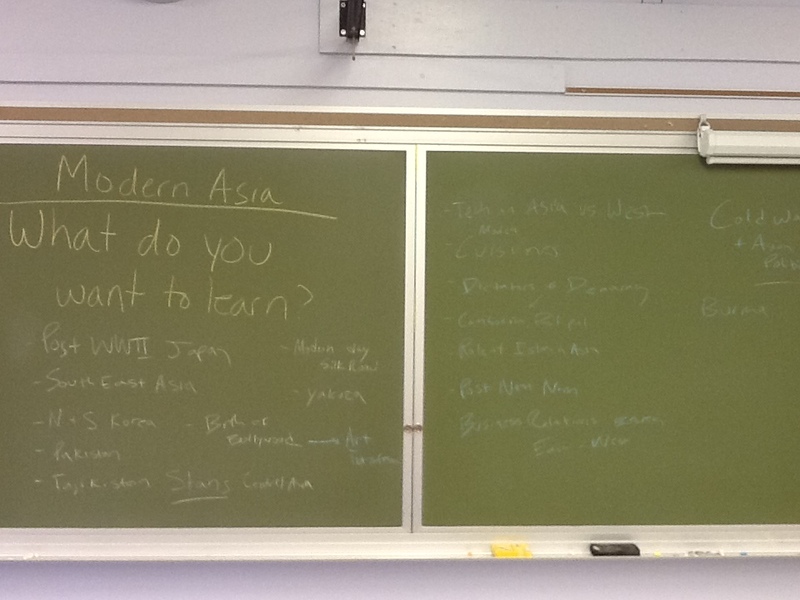 The question on the blackboard caused no real concern whatsoever; immediately students started to discuss what they were interested in learning about Modern Asia. I had one student record all of the ideas on the board. At first, it was a geographic tour with students naming countries we could study. After that we got some more thematic ideas. It was actually pretty easy. Once we had a board filled with ideas, I asked students to make a list – which of the proposed topics interested them and which did not. There was definitely overlap – looks like we will be investigating organized crime and Pol Pot as it first two topics. The blank stares and silence came when I asked them how they want to learn. One student suggested watching documentaries. Another said research. Neither answer is completely satisfactory. This is the next frontier – helping students envision the different possibilities for learning and determining which might work best for the topic and what combination might produce the best learning. On the one hand, lesson planning is part of my job; on the other hand lifelong learners do not have teachers along for the ride planning their learning. This is the area where we will be working next – merging skills and content in meaningful and engaging ways. I want students to contribute to the how, not just the what. Next class, we will start talking about what qualities get someone on the worst dictators in history lists. Then, we will look at a slideshow of photos from Time about Pol Pot’s regime. Next we will compose a list of questions and then set about finding the answers. After that, we will see. Stay tuned. This question was asked by my colleague @HeidiHutchison at Edcamp Baltimore on Saturday in a session discussing Project Based Learning. It has stuck with me ever since. As usual, when I feel like I am pushing the envelope, I use my senior elective as a laboratory. This time, it is the Modern Asia course. We are finishing up our study of India with a few days on the evolution of the Indian economy post-independence. After that the curriculum is wide open to the end of the semester. Last year, I had each student choose an individual topic to research and create a presentation to class. Included was an analytical paper as well. It gave the appearance of student autonomy and control, but they really only had a choice about content. Autonomy over content is substantial, but not the same as the freedom that comes from asking the question Heidi posed. So, I will go into class tomorrow and ask the students what they want to learn. I need to be prepared to help support individual and small group work, as well as potentially some whole class work. Do they all need to write a paper to be analytical and reflective in their work? Do they need to do some sort of class presentation? Do I want to insist that they create something involving technological skills like an infographic? I doubt it; at least I doubt that all students need to do the same things. I do want them to be analytical, reflective and public with their learning. Beyond that, I am open. I attended a session yesterday at the annual AIMS conference on the “brain friendly classroom.” The presenter started with the question ” What is learning?” I have been thinking about it since then. I have been telling students, parents and colleagues that school needs to be about the learning. I realized that I am not really sure what I mean. At least, I cannot come up with a definition/explanation that I find satisfying. So – rather than try to define it, I want to think about some moments in my classes today where I think learning happened. My first class today was sophomore Modern World. We spent the first part of class debriefing the Crash Course video and responses to the essential questions about the Spanish Empire. Very traditional and yet students were engaged; they collectively knocked it out of the park. I was able to note the astute observations made by different students and they could learn from one another. Then, in preparation for a small research project involving a presentation I directed them to a blog where students had written and reflected about effective presentations (www.ageofex.wordpress.com). After reading and even leaving some comments, we talked as a class about what their presentations should and should not be. The last part of class involved students getting their groups, their empires to research and planning what each student would do before the next class. Each component here involved learning – some content, some process, some reflection. Then I met my first section of junior US history. I gave them two options – blog work with our quadblog – reading and commenting, or working on the research for their immigration projects. Students chose both options and many did a combination of the two. They wrestled with different points of view in the blogs. They refined their research questions. They found helpful sources. In the middle of all of this someone asked about the event of a tie in the electoral college. Within a minute another student had a video answering the question and several students gathered around to watch. Learning happened. My end of the day class – the second US history class – had the same two options as the previous class and one additional option. They could read their self-selected Fall Reading book. Whenever the class meets last period, I set time aside for students to read. Several students read the whole time. Others worked on their immigration research and talked with me about their initial findings and their next steps. Some read blog posts about today’s election. I actually took the time to read some of my book as well. One student swapped out a book he did not like for another one that interested him more. Another student discussed her two ideas with me and then decided on her topic. A third student shared the form she believes her project will take. I cannot quantify it, but I know that learning happened. There are all kinds of things that pass for learning. Productive learning is more easily quantified through assessments. The problem is that learning takes many forms. The student engaged in a book was learning. The students hashing out effective presentations were learning. The student who wandered around the Internet moving closer to a research question was learning. Of course, the kids who reversed course on a topic or who read several blogs without commenting were also learning, I think.